The first 12 weeks as a new parent can often be described as total love fest with the new baby mixed with fatigue, unwashed hair, and an overwhelming sense of “what did I get myself into? 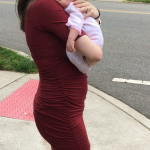 !” Here are some helpful hints to make the transition from maiden to motherhood a little more comfortable. Researching and organizing support and resources is never a waste of time and can only lead to less stress when problems arise. Helpful support groups would include new mother support groups, sleep support groups, postpartum depression support, breastfeeding support groups and pretty much anything else where new parents gather to listen without judgement and offer kind words. One in 5 women reports having postpartum depression. Experts actually believe a more accurate occurrence is that 1 in 3 women will experience some sort of perinatal mood and anxiety disorder. Close friends and family should know the signs of PMAD. A few weeks before my first child was born, I asked a friend for advice about how to find balance in work and parenting. She looked me square in the eyes and said, “Staff up.” While I don’t have a personal household staff, I did learn to ask for help from anyone who walked in my door those first 12 or so weeks. It’s OK to need help and not depict the “Super Mom” image many have stuck in their head. Your body will continue to change. Be kind and patient and will find your way back to some resemblance for your former shape. Many people post-baby have a love/hate relationship with their body. It’s amazing that your body produced a baby and continues to produce milk should you decide to breastfeed. But, it can also be disheartening to feel tired, have an achy back, neck and shoulders from countless hours of holding and feeding baby. It’s unrealistic to assume a baby will fall asleep on its own in the first 12 weeks when simply put down in a bassinet. Many parents find they are nursing or feeding their baby to sleep, which requires a lot of sitting and physical strain. With time, the baby will be more independent with sleep and mom can start some appropriate physical activity. Be kind and patient as you start to get reacquainted with your postpartum body especially as you return to your fitness routine. Whether you go to a gentle yoga class or are a marathon runner, you may feel a bit tighter and weaker than before, but slowly, with love and understanding, your stamina will rebuild and you will start to find some more bounce in your step. Who hasn’t woken up, looked at the clock and said, “OK – I get to go back to sleep in 15 hours.”? And knowing perfectly well those are going to be some long 15 hours ahead. Some days may feel very challenging as you start to work out a routine with your baby. Throw in the baby missing a nap and crankiness erupts! While days like these may feel like a fast sprint to the end, try to cherish the beautiful moments of your budding family because time moves forward and this delicious little person nestled in your lap will soon be running outside to bike with their friends, just giving you a shout goodbye.